Time is no longer it seems! Just turn around and things are upon us, and one of those "things" is Christmas....wow. I remember clearly putting everything away. This year I want a White Christmas. 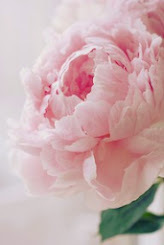 It will be my first ever...... light, elegant, bright and so very pretty. One nice green balsam tree out on the front porch for all passers by to see lit at night, some good cheer....nothing like a lit and decorated Christmas tree outside for all to see to make one feel something is right. Inside, I will have several wreaths, and lots of garland even if I have to make it myself which I probably will with all the cut greens they throw away from tree trimming. I used to make them as a florist and I could not get the sticky balsam resin off my hands for a week, but then in New York, we had all kinds of greens, not just Fir as they do here....here there are no choices in types of trees, only Fir. 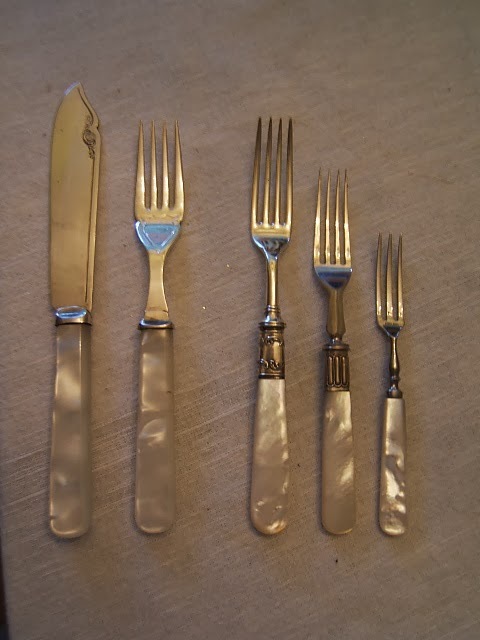 Well I decided life is only getting shorter and I want these because to me they are so beautiful....and that is Mother of Pearl Flatware or cutlery. I have seen these always and loved them but it never really registered in my own head as to acquiring any.....until recently. Then I searched and searched online, etc, and found them sold only on ebay or in very very expensive auctions! I think they don't even make them anymore. And based on what I've seen on ebay, people are literally grabbing these all up to make them a "collectors item", a money thing. I have literally watched these sets of Mother of Pearl or MOP, being snatched up by aggressive buyers only to find them relisted again for twice the price! I've seen this! I compared pictures from what I had been "watching" and soon what was bought was rephotographed and auctions began at twice the price. I just checked today for the recent listings and they all begin in the hundreds of dollars!!! People are crazy greedy and I find this an ugly trait. Yet I do believe I got a couple, or rather several sets at good prices before this happened. What is very cool, is that my housemate also bought a couple of sets, and I bought three. What is NOT cool however, is that they don't tell you most of those sets are Fairy sized flatware!...and not human sized! I had received my first purchase in the mail and the forks were smaller than the average American fork. I thought I misread something but did not. The 2nd package I figured would definitely come in the "normal" size. But it did not....it was actually smaller! I began to panic now, because what on earth am I going to do with these tiny forks? I bought them to use, not just to collect and store! I'm not a collector, I use everything I have. Collecting seems a waste to me, and I don't have the space. So surely the next package would be "normal". They were smaller yet again.....and I'm talking a steady graduating shrinkage in size, definitely shrinking people! What ever will I do with them? good thing I did not pay alot! 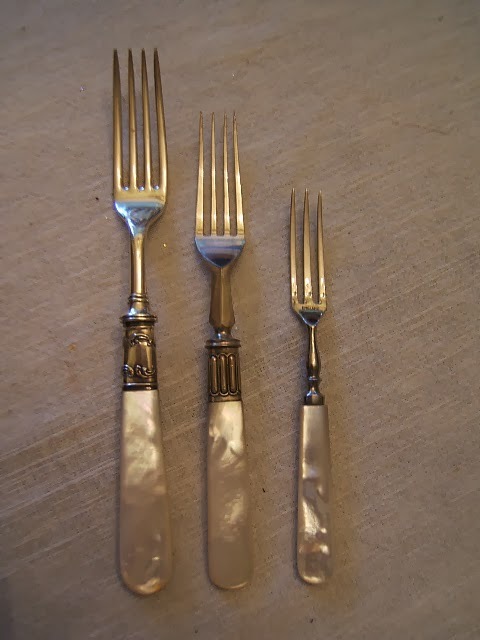 But by this third package I was distressed....so much time online, watching and bidding, and hoping and what have you, only for flatware I could not use because they were tiny.....if anyone knows what they make these for please tell me! Anyway, after a couple more tries on ebay and me asking for measurements etc and reading descriptions more carefully, I got a set that are basically normal size and useable and one set did come in "normal" sized too, and they are lovely and I keep them on the table. 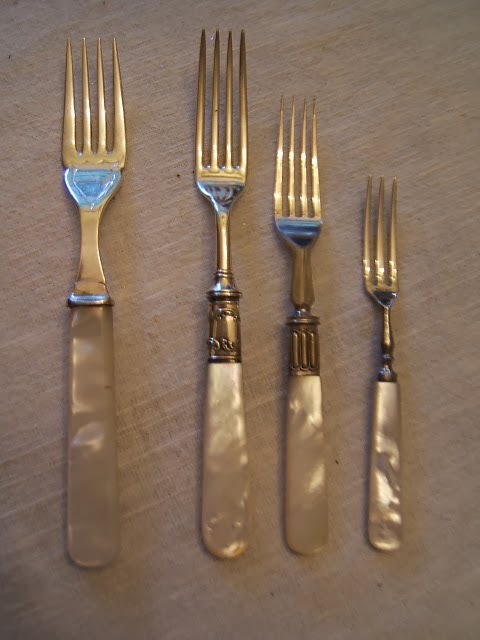 The one on the far left is "normal"....yet still a bit smaller than average American forks. 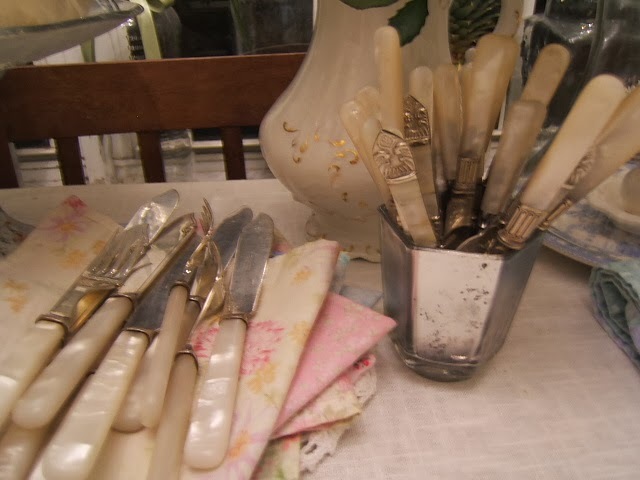 I have 8 forks, and knives which are not fit to cut anything really, but more like butter knives, I think they call a Fish Set....and if anyone can explain that one too I'd appreciate it very much. 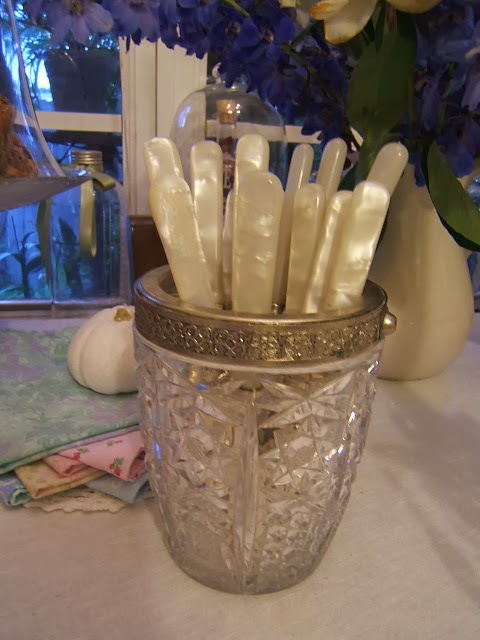 Recently we had guests and sat at our tiny square table, and once I served the food, they asked for forks and I pointed to the container sitting there free to be grabbed and then napkins too, just casual.....free to grab and use and yet they were the most treasured and exquisite flatware one could use, Stirling Silver in some cases, and Mother of Pearl brilliance, and beautiful cotton Shabby Napkins......Silver and Pearl, free for everyday use, so casual and yet so luxurious. 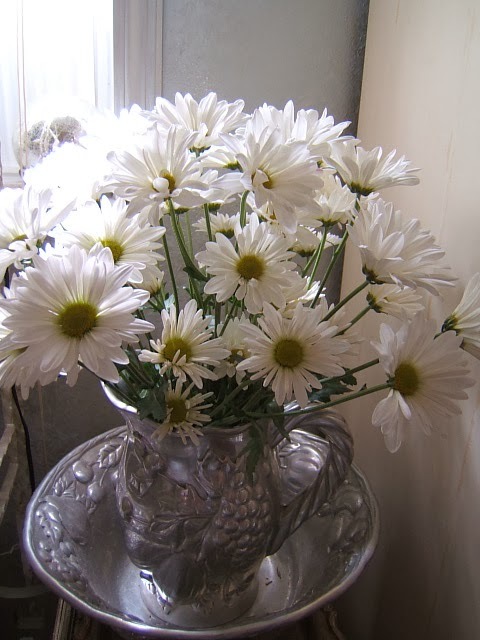 But here are the pics and I have some very pretty flowers too. 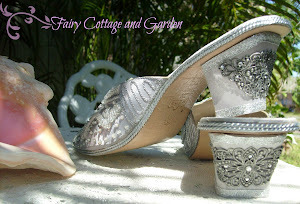 I do love the Mother of Pearl, they sit in places where the light and candlelight hit them and they DO glow! If we're going to work with utensils they may as well be so beautiful we love handling them all the time. 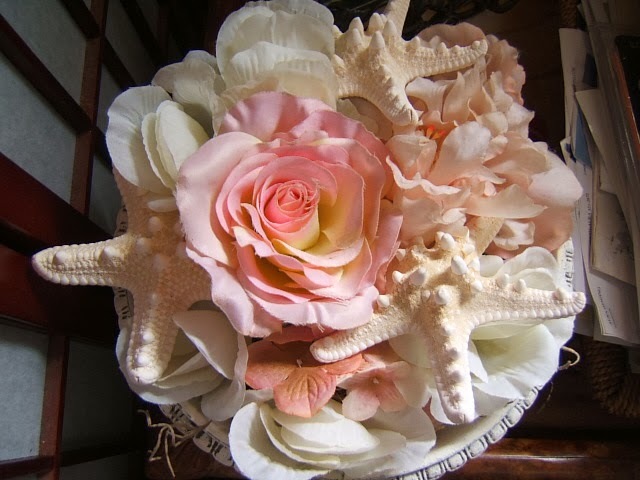 I leave them on the table on top of napkins or simply in a crystal or mercury jar.....to enhance reflections and sparkle. 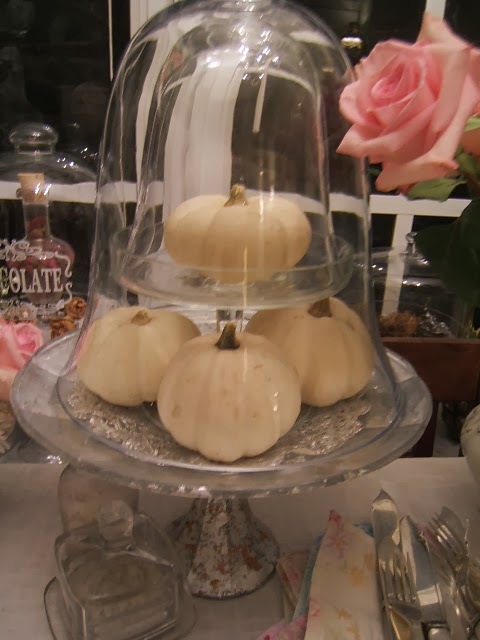 This was not a clever idea as much as it was necessity....I needed space, and both these cloche's were empty and I put one inside the other and they fit, and I added this time the white pumpkins. Love! 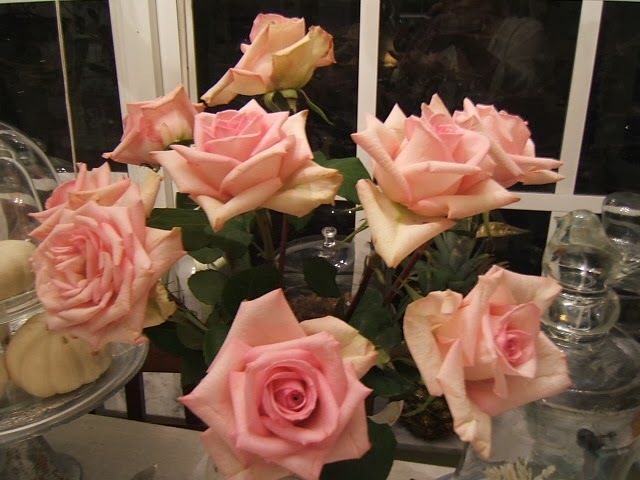 do we ever get tired of pink roses??? My room has one place I can "play" with in moving things around and changing things. This bureau top is the place. 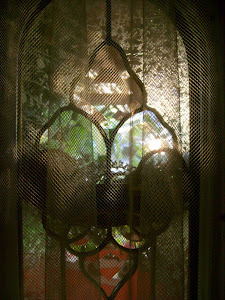 I like it because it is just low enough and just high enough and gets the morning light. 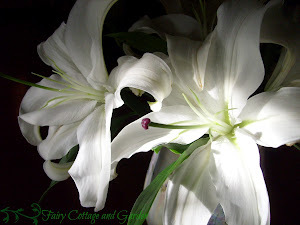 Thanks for visiting, I always love to blog my flowers and the changes. 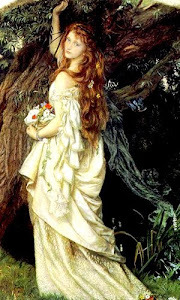 This helps me to remember all the beauty and bounty there is from Mother Nature, and how much I have to embrace. Your grey pearl walls are lovely! 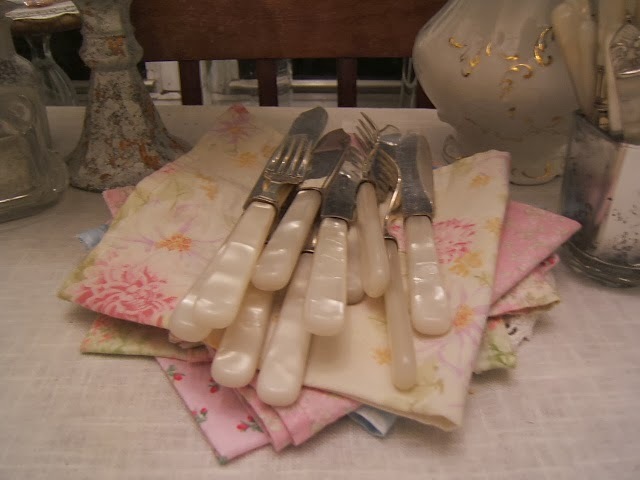 I have tried to find Mother of Pearl flatware at antique shops, and markets. I can never find full sets. The pieces you have are beautiful! How fun to be able to use them! I love pearl everything--I love opal too. 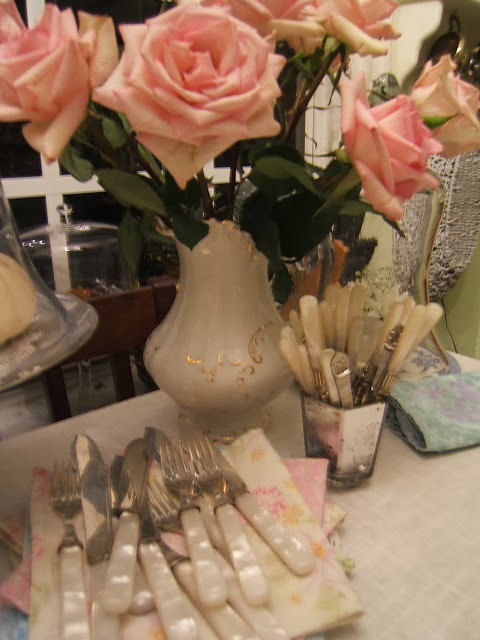 That silverware is so pretty and those pink roses made me smile. I miss mine! Your walls are so pretty--I want to use that pearl paint sometime. I had the link saved on my computer and lost it when I had computer problems. Could you tell me the link again to where you bought that paint? 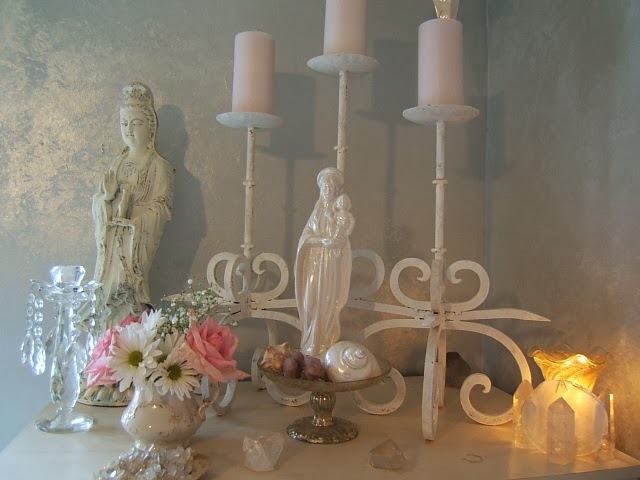 Hi Sandy, the paint is by Modern Masters "Shimmer" Metallic Paint in pearl white sheer.....and I diluted it by a third and dappled it on the grey walls....hope that helps. I think you will love love love it. Could they be for old tea sets? 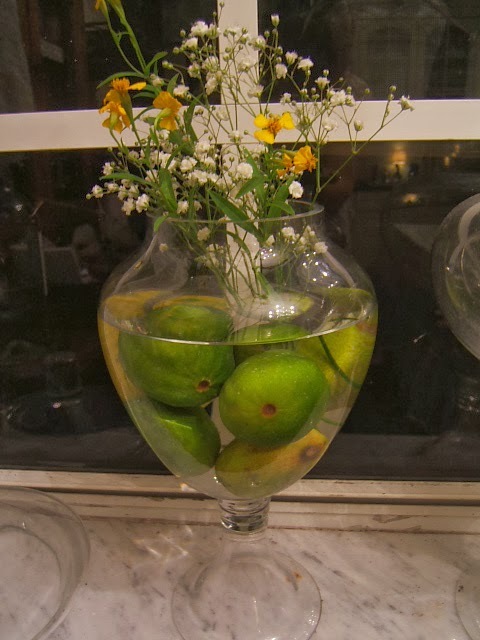 For jams and little cocktail dishes? Or for kids pretending to be giants?? They're lovely, would love to try the little ones in my hands. 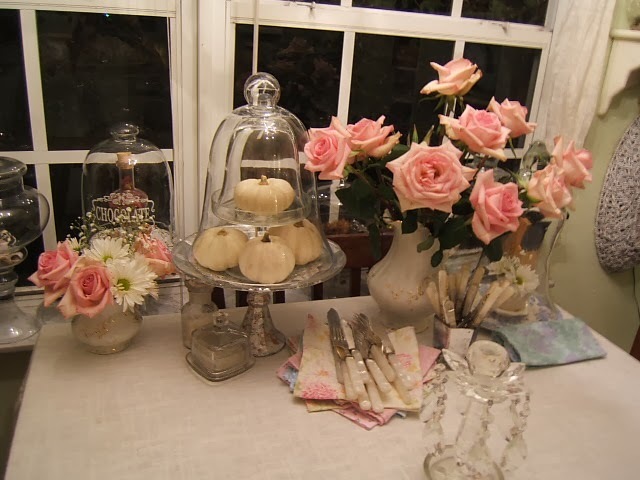 Super beautiful and enchanting post.I love pear flatware..it is exquisitely charming...beautiful photos..I love all of your floral creations..stunning! Thanks for sharing and shining your magic! 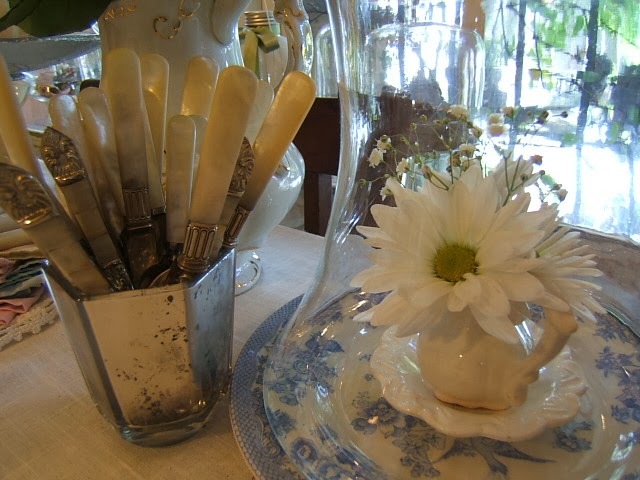 Absolutely fantastic sweet Lady...I have similar flatware and I love it. 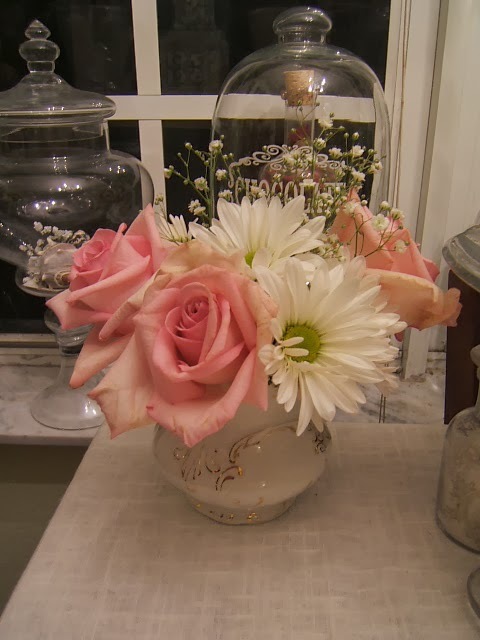 It lends a totally different and unexpected style to the table,and a white Christmas? Well, we are not getting the snow we usually have, but in my house, all is white and gray. So lovely. Thank you Anita for visiting me! how nice to see you here. My White Christmas will be only inside, outside it will be semi tropical and green, but inside, another world....soon I will begin. Loving gray too alot! most of my clothes right now are shades of gray....gray and white a perfect combination! The MOP is gorgeous.......I have always loved this so much. Well thanks for explaining that! I will leave them out for those things next time I serve anything that small LOL warmest hugs back to you! 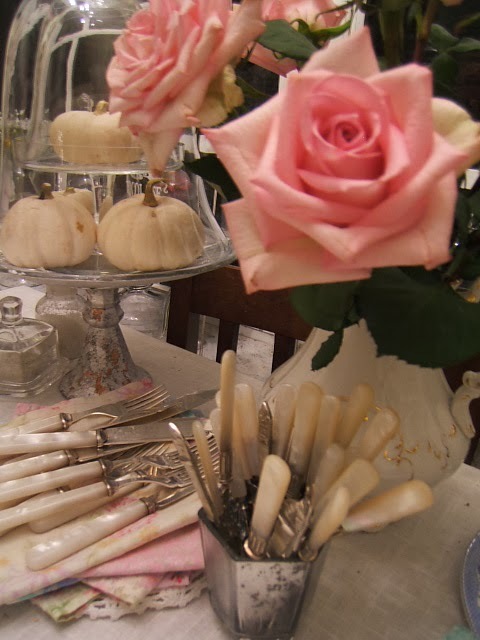 Beautiful silverware! 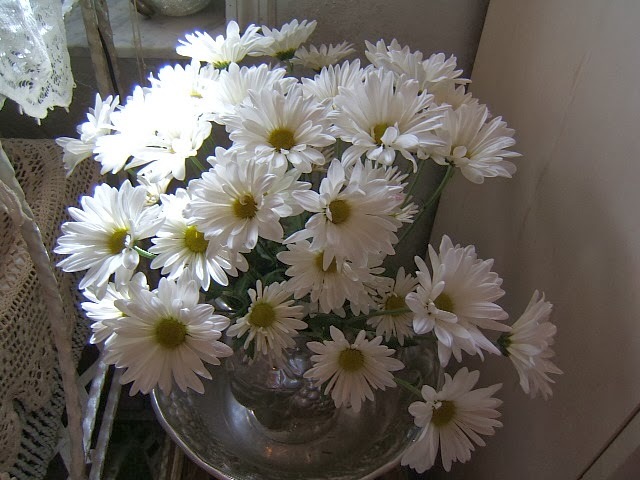 ~ I love to find some in thrift stores, and Goodwill stores. Seems people don't like to use it, because I've heard over & over, "It's too hard to keep clean!" Pfft...if you use it daily, it stays clean and shiny;its the letting it sit in a drawer that tarnishes it. Your walls are fabulous, such a serene color. wonderful post! I just went via email to chat with you, but I had to come back here to get another whiff of YOUR magic here. 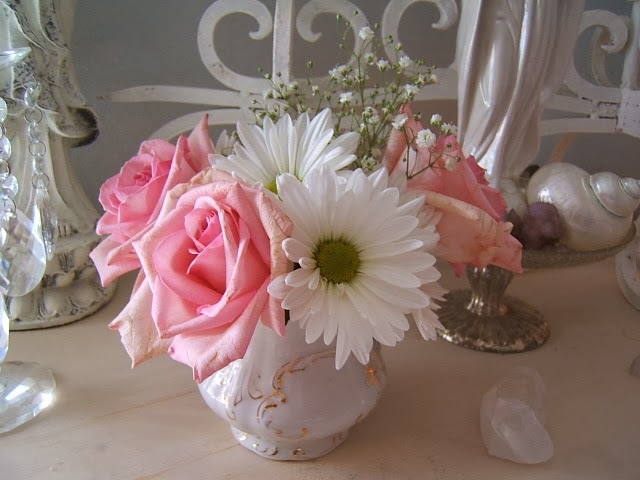 That flatware is divine and your statues, the roses, all so glorious! 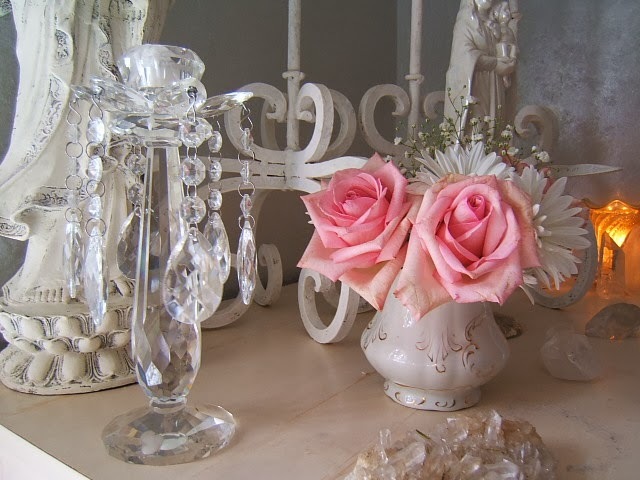 I saw a photo on Pinterest today of a white chandelier embellished with ROSES!!!!!!! Can you imagine that? 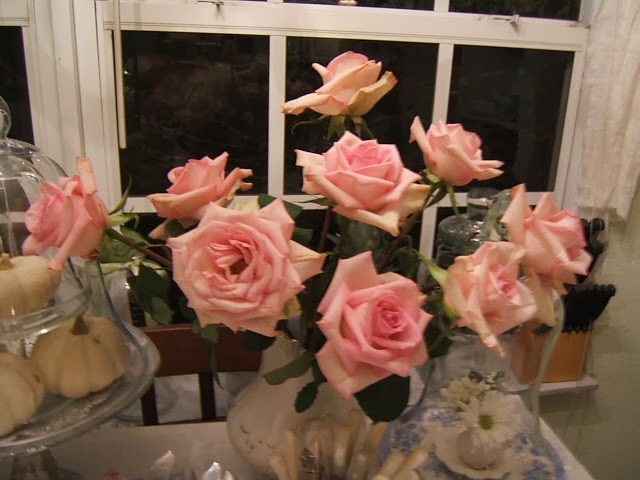 Oh, I was tickled again to see your comment about your idea to put up roses on your chandy! YES! I think chandeliers lend themselves to such beauty for the holidays! 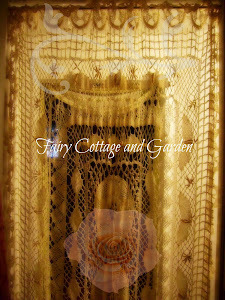 A wonderful WHITE shop in town has a grand crystal chandelier that the talented owner (an interior designer) dresses up with twigs. 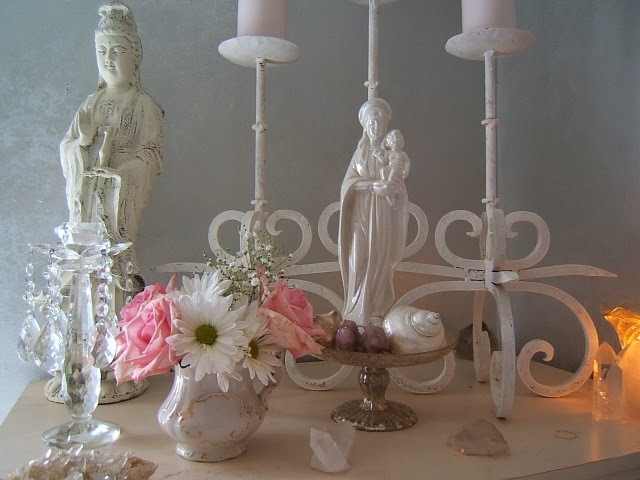 The woodland look coupled with the crystals is a marriage made in decorator's heaven. But ROSES? WHITE, maybe? 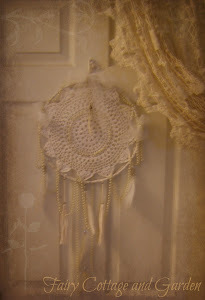 I am enjoying hanging white and gray ribbons and mercury glass ornaments hanging from mine. Ah yes, do decorate with wings. If I could, I'd put up more as well, but my walls are already taken up with other items, but I'd love to see what you come up with! This weekend, I'll take more pictures and show you! I have to run off to school now. 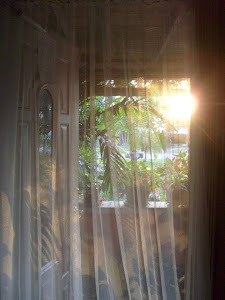 Thank you for joining in and sharing your lovely post at Fresh-Cut Friday. 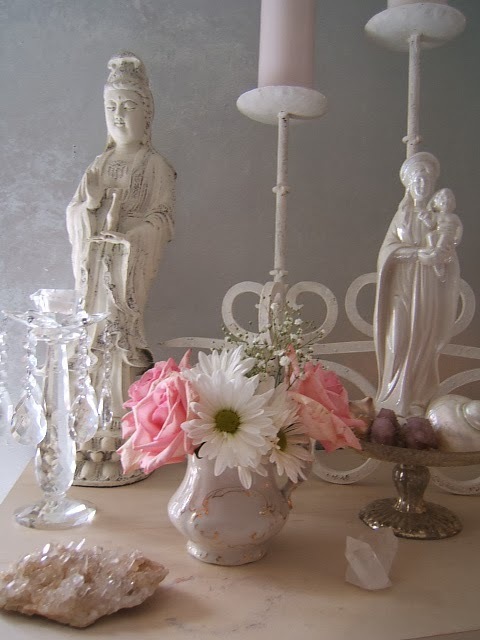 I really love mother of pearl everything! Your flatware is so pretty. 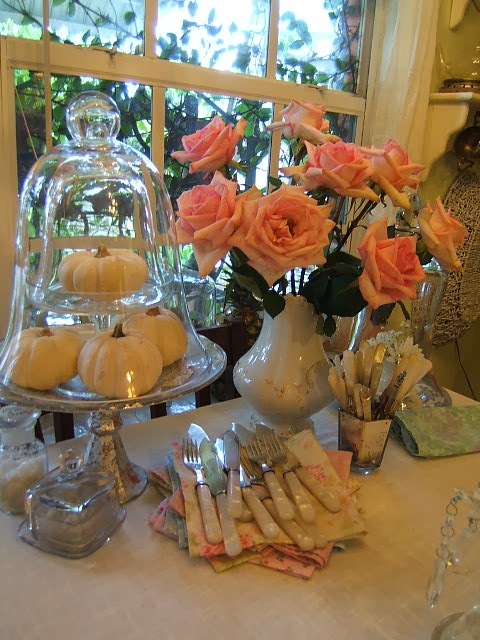 All of your vignettes are stunning, and the napkins and roses are my style! LOVE it all! I'm linking from Fresh Cut Friday (I was late to the party)!